The Hydro-Probe was the first moisture sensor to use the digital microwave moisture measurement technique. It has integral signal processing which provides a linear output (both digital and analogue) and it can easily be connected to any control system. 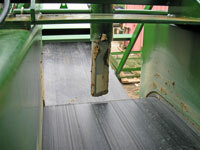 Typical applications include sand, cement, concrete, asphalt and aggregates. For organic materials the Hydro-Probe XT is recommended. Designed for use in processing plants which use bins (silos), chutes and conveyor or feed belts, the sensor is positioned into the flow of material. Measurements are taken 25 times per second as the material passes over or around the sensor face, meaning that the sensor can rapidly detect changes in moisture levels. 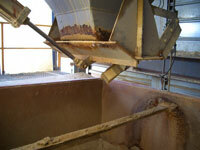 Real time adjustments to the moisture content of the material can then be made during processing if required. This ensures that the manufacturer can continually produce a consistent, quality product and reduce costs by limiting the amount of wasted or spoilt materials. The sensor can be installed in a variety of locations where there is a flow of material. Some typical examples can be found on our installations page. A range of accessories are available including extension mounting sleeves and clamp rings to assist with fitting.